NEW YORK – More than 100 top artists teamed up to support the two-hour Hope for Haiti Now telethon, which raised at least $57 million so far, according to its organizers. That sum reflects direct donations via telephone, text and Internet in response to the telethon itself, and does not include funds raised through iTunes. The telethon aired Jan. 22 on all major TV networks and appear on cable channels including CNN, HBO, MTV, TNT, BET, Showtime and others, along with live streaming and other support from Web sites such as YouTube, Myspace, Facebook and Twitter. The show, launched in the U.S. at 8 p.m. Eastern Time, included broadcast segments from New York, Los Angeles, London, and Haiti. It was produced by Joel Gallen and Tenth Planet Productions, in collaboration with Viacom's MTV Networks and George Clooney. The artists included Wyclef Jean, Bruce Springsteen, Jennifer Hudson, Mary J. Blige, Shakira, and Sting in New York; Alicia Keys, Christina Aguilera, Dave Matthews, John Legend, Justin Timberlake, Stevie Wonder, Taylor Swift and a group performance by Keith Urban, Kid Rock, and Sheryl Crow in Los Angeles; and Coldplay, and a group performance by Bono, The Edge, Jay-Z, and Rihanna in London. The technical team in New York included Tom Kenny, LD, and Star Kahn, production designer, working from Kaufman Astoria Studios. Tim Rutledge served as LD in London. Production designer John Calkins and LD Allen Branton handled the Los Angeles production at CBS Studio 26. PRG helped the effort by supplying the lighting gear and crew for the Los Angeles portion of the broadcast. 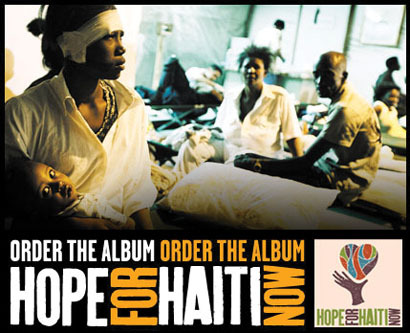 Starting Jan. 23, iTunes began selling downloaded songs from the telethon for 99 cents, or $7.99 for the full album, and all proceeds are going to relief organizations including the Clinton Bush Haiti Fund, United Nations World Food Program, Oxfam America, Red Cross, Unicef and the Yele Haiti Foundation. In addition to the funding generated via the telethon and iTunes, companies in the entertainment industry are conducting their own fund raising initiatives. Rose Brand, for example, has already donated $14,193 for disaster relief in the earthquake's aftermath. Rose Brand employees contributed $7,096.50, and the company matched it, for a total donation of $14,193 to the U.S. Fund of UNICEF.